For the Baronial Investiture of Baroness Anne de Tournais and Baron Giles Leabrook of Politarchopolis I was given materials to make a livery collar in the style of those depicted in early 15th century illuminations, notably the books of hours commissioned by John, Duke of Berry. A collar pattern drafted by Mistress Rowan Perigrynne. The brief was to design and execute a livery collar in a 15th century French style to match Their Excellencies investiture clothing, but also in a style and colour representative of the Barony of Politarchopolis (i.e. in line with the baronial arms, see Figure 1)within three weeks. . Figure 1: The baronial device of Politarchopolis is red and white, depicting a burley griffin and a laurel wreath (Lochac Roll of Arms, accessed November 2018). Figure 2: The canton device of Torlyon, which includes a cross and a laurel wreath (Lochac Roll of Arms, accessed December 2018). Figure 3: The canton device of Okewaite, which includes acorns and a laurel wreath (Lochac Roll of Arms, accessed December 2018). They may also have a pendant hanging from the middle-front of the collar (see figures 5, 7, 9). 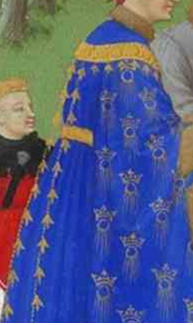 Figure 4: Detail of a man wearing a collar from Très Riches Heures du duc de Berry Folio 5, verso: May (Wikimedia Commons, 2012). Figure 5: Detail of John, Duke of Berry, wearing a collar adorned with roundels and a pendant from Très Riches Heures du duc de Berry Folio 1, verso: January, accession number Ms.65, f.1v (Wikimedia Commons, last accessed December 2018). Figure 6: Detail of a man wearing a collar adorned with roundels, fleur-de-lies tassels, and a pair of tails from Très Riches Heures du duc de Berry Folio 4, verso: April (Wikimedia Commons, last accessed December 2018). Figure 7: Detail of a man wearing a black collar adorned with gold and a roundel pendant from (reference to come). Figure 8: Detail of a woman wearing a collar adorned with roundels, fleur-de-lies and oak leaf tassels, and a pair of tails from Très Riches Heures du duc de Berry, accession number Ms.65, f.8v (Wikimedia Commons, last accessed December 2018). Figure 9: Detail of a woman wearing a collar adorned with roundels, possibly bead tassels, and a roundel pendant from the Très Riches Heures du duc de Berry Folio 4, verso: April (Wikimedia Commons, last accessed December 2018). 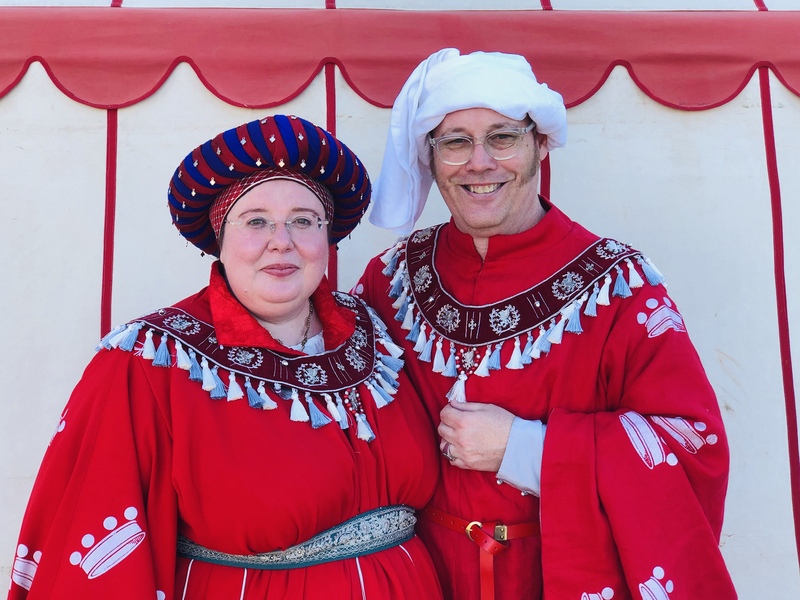 Taking all of this into consideration, I used the red velvet as the base fabric for the collar to represent the Barony (and because it was the fabric provided to me for this task), even though I have not seen examples of red collars. I also chose to decorate the collar in strictly silvers, greys, and whites (white being the heraldic depiction of silver) to represent the barony. The brief I was given was to use the materials provided to sew the metal accoutrements to two collars and that Their Excellencies outfits were based on those clothing types depicted in various books of hours commissioned by the Duke of Berry. I was also given free rein to design the collars as I saw fit. To achieve a look consistent with the styles of collars observed in the Duke of Berry’s books of hours, I designed the collar embellishment in the styles seen in figures 4 and 6 to be alternating rondels stylised instead into laurel wreaths (a symbol used in all SCA group heraldry – given the role of this particular piece of regalia) separated by three parallel lines . 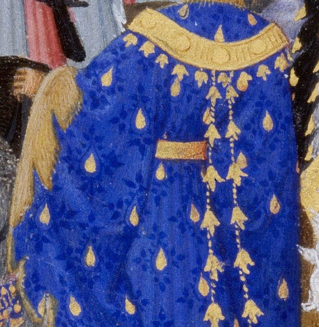 This style of embellishment is visible in a close-up of Folio 5, verso May of the Très Riches Heures du duc de Berry (figure 10). 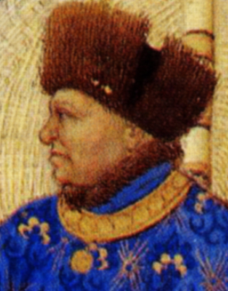 Figure 10: Closer detail of a man wearing a collar from Très Riches Heures du duc de Berry Folio 5, verso: May (Wikimedia Commons, 2012). It is difficult to identify from the illuminations what materials these embellishments were made of – it is only evident that they were the same colour as the base of collar in figures 4-6 and 8-9, or gold on black in figure 7. Given the materials provided, materials I could provide that would harmonise with them, and the baronial colours being suitable for these pieces of baronial regalia, I chose to use silver couching and purl to create the rondels and parallel lines in sets of three. There is evidence of metallic threads (including gold, silver, copper, or combinations of these) being used to embellish clothing, accessories, tapestries, and religious garments across time and space. Silver or silver alloy threads were said to be used by the Romans from the 1st century AD with their use spreading across Europe in the 12th and 13th centuries (Karatzani, 2012; Hacke et al., 2004). Furthermore, livery collars (at least, in nearby England in the 15th century) were status symbols known to be made of “a band of leather or velvet decorated with devices usually composed of silver, silver-gilt or gold, and was worn about the neck” (Ward, 2014). This makes the choice of making the band out of velvet and embellishing it with silver thread, purl, and braid appropriate for a livery collar . The stems of the laurel rondels were executed with silver cord couching and the leaves were stitched using loops of silver purl. = The sets of three parallel lines between each pair of roundels were also couched in delicate silver cording. In order to achieve a rondel pendant look for the centre front, I threaded a piece of bronze wire through one of the pewter griffins and threaded interchanging red beads and white pearls, twisting it into a circle around the griffin. 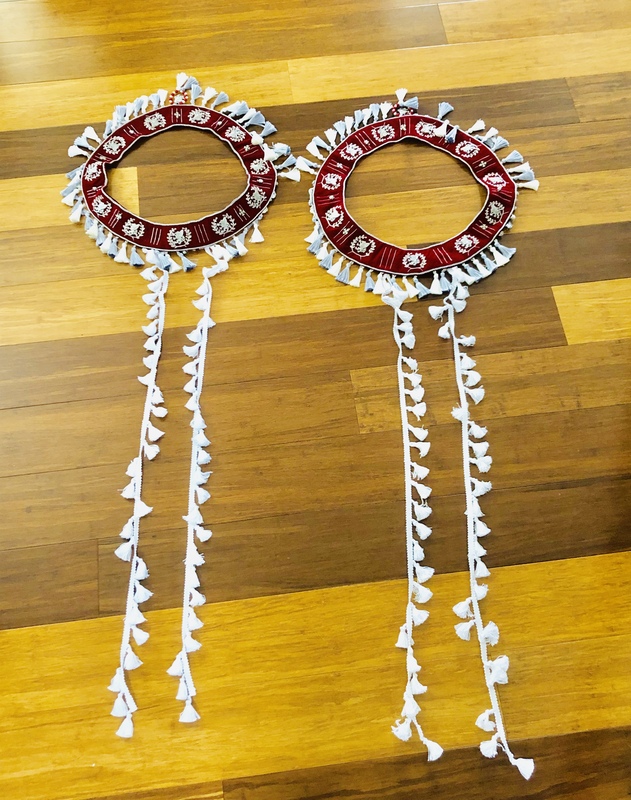 I had to cut two tassels off the front to stop the pendant being obscured, and decided to add the tassels to the bottom of the roundel to make it more pronounced (i.e. to make it hang lower than the tassel edging of the collar). Around the top and bottom edge of the collars, a silver braid was stitched down to imitate the raised edge look in Figure 10. For use around the bottom edge of the collar, I was provided a thick gimp braid of greys and whites with alternating white and grey tassels hanging along the bottom edge. 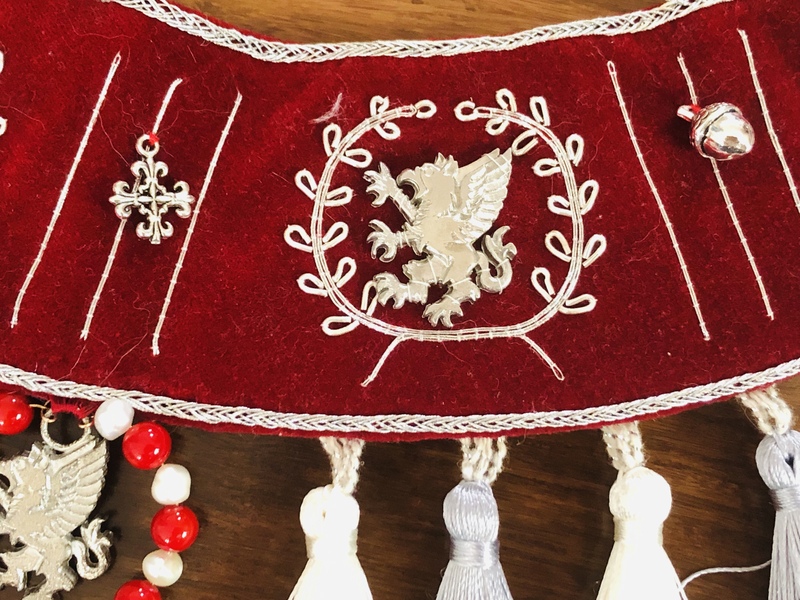 The braid itself was too thick to use on the surface of the collars (the griffins and laurel wreath rondels wouldn’t fit if I used it on the surface), so I decided to sew the braid in between the velvet and the linen lining leaving only the tassels evident along the bottom edge of the collars. This provided a look analogous to the fleur-de-lies/oak dagging/tassels evident in figures 4, 6 and 8 . Although it was not mentioned in the initial brief, several collars evident in illuminations (figures 4, 6, and 8) included a pair of long tails of fleur-de-lies/oak dagging/tassels separated by what appears to be gold beads (or, perhaps, bells? ).I had heard that Their Excellencies investiture clothing would be relatively plain, to be enhanced by the accessories and regalia that they would wear. As such, I decided to include tails in my design. In figures 4, 6, and 8, the dagging used along the bottom of the collars match the tails hanging down the back of the collars. 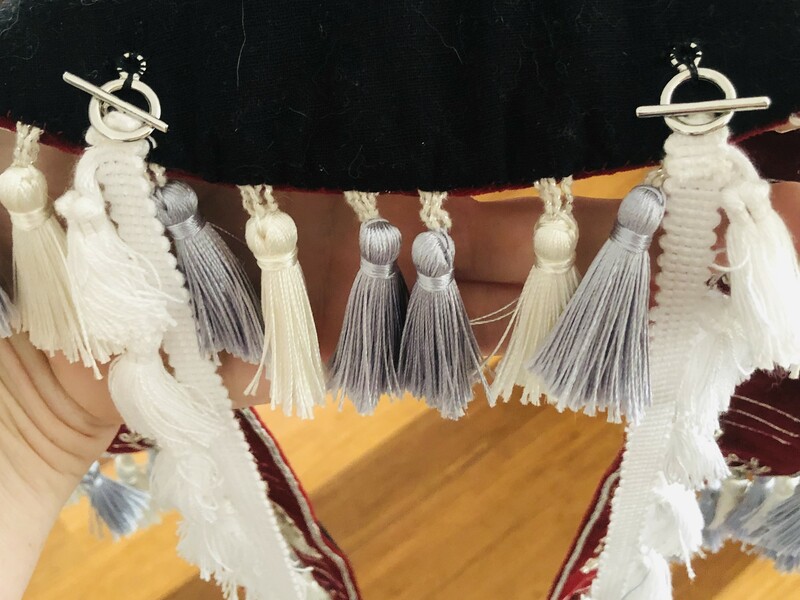 I chose a white gimp braid with white tassels hanging along one side to make the tails. I was limited in the length by the amount of braid available (less than 4 metres between both collars). I decided to make the tails detachable as I could foresee them being problematic (for example, windy days or camping events), and it will also allow Their Excellencies to have different tail options made in the future. Making the tails detachable was achieved by stitching toggle jewellery clasps to the top of each tail and the underside of the collar (the clasps being hidden from sight when worn). Figure 11: Close up of the inside of a completed collar showing the toggles (loops and t-bars) that make the tails detachable. Photo and collar by Ceara Shionnach, November 2018. 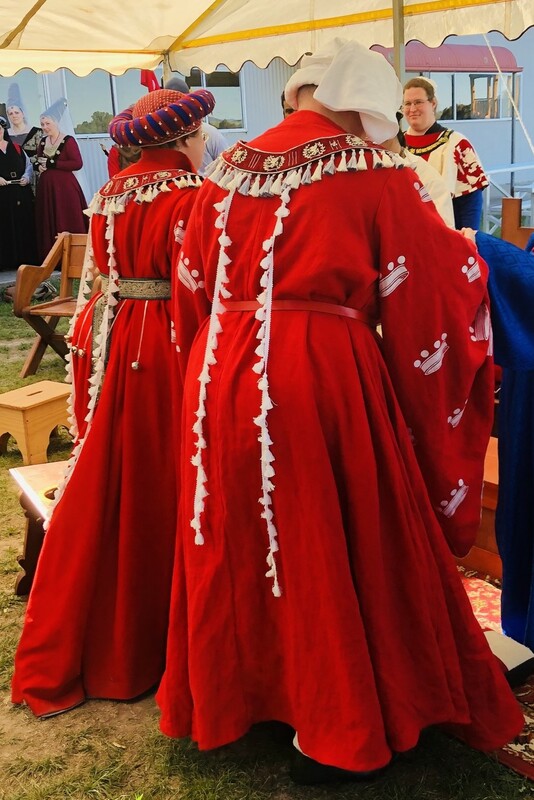 On 1 December 2018 (AS53), the collars were presented in court by Khagan Kinggiyadai and Yeke Khatun Altani (Lochac’s King and Queen) to Baron Giles and Baroness Anne as baronial regalia. Figure 12: Baron Giles and Baroness Anne wearing the completed collars – front view. Photo and collars by Ceara Shionnach, December 2018. Figure 13: Baron Giles and Baroness Anne wearing the completed collars – back view to show the tails. Photo and collars by Ceara Shionnach, December 2018. Figure 14: Completed tails laid out on the floor. Photo and collars by Ceara Shionnach, November 2018. Figure 15: Close up of the couched laurel wreath roundels. Photo and collars by Ceara Shionnach, November 2018. Hacke, A.-M., Carr, C.M., and Brown, A. (2004). Characterisation of metal threads in Renaissance tapestries. Proceedings of Metal 2004, National Museum of Australia (Canberra). Karatzani, A. (2012). Metal threads: the historical development. Assistant Professor, Department of Works of Arts and Antiquities Conservation, Technological Educational Institution of Athens (ATEI). Ward, Matthew (2014). 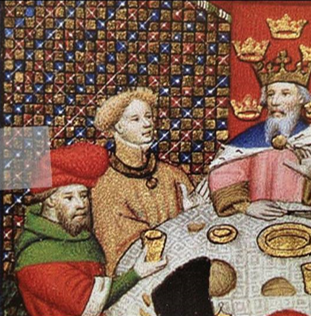 The livery collar: politics and identity in fifteenth-century England. PhD thesis, University of Nottingham. Folio 5, verso: May. See Figures 4 and 10. Folio 1, verso: January, accession number Ms.65, f.1v. See figure 5. Folio 4, verso: April. See figures 6 and 9. Folio 8, verso: August, accession number Ms.65, f.8v. See figure 8.